While this is pretty much only for our European readers it is still news worthy for everyone, Elgato has released their iPad Tuner EyeTV Mobile. The tuner allows for live viewing of over the air DVB-T broadcast tv on the iPad 2. 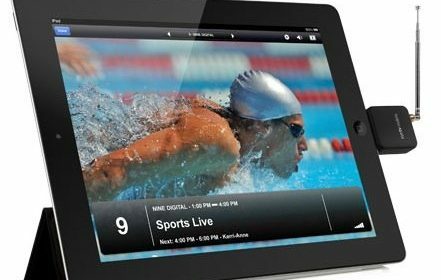 The software gives you a full program guide good for 7 days, and with a fully charged battery the iPad 2 with the Elgato tuner will allow up to 8 hours of live TV viewing. This is one interesting piece of hardware, I would love to see something like this become available in North America. I really could see a use for this in my every day life. Not sure how well it would work while on a moving vehicle, but if it does I could use it on my daily train commute to work. EyeTV Mobile’s integrated EPG offers up to 7 days of detailed programme guide data (the amount of EPG data varies by broadcaster). A pull-down calendar menu, navigation buttons for Now/Tonight/Tomorrow and genre colours make it very easy to find one’s preferred shows. Users can email programme details directly from the Guide to recommend upcoming shows to friends or print them with AirPrint-enabled printers. Eight hours of live TV, antenna options for portable and indoor use.